“Beach in Stobreč” by Pudelek (Marcin Szala) – Vlastito djelo postavljača. Licensed under CC BY-SA 3.0 via Wikimedia Commons. Not many people know that Stobreč is an oldest Greek settlement on Adriatic. Old as Issa (known as Vis today), and, surprisingly, older than Split. In those times it was called Epetium. It’s settled on peninsula seven kilometers South from Split. Or better to say, it once was. Today Stobreč looks different – next to the old part there is a living area that was built during the second half of 20th century. Old Greeks, as we know them, were quite strategic – that’s why Stobreč fit perfectly to their plans. Not only that peninsula creates safe port on it’s inner side, but the bay itself welcomes river Žrnovnica. To the Old Greeks mouth of Žrnovnica was an entrance to the mainland where most of the land is highly arable. Today people still grow fruits and vegetables along the river. Mostly they plant it few kilometers away from sea – due to the salty water. Exactly the combination of seawater and river’s fresh water creates brackishwater – true natural diversity. But another and yet, for most of the swimmers more important offer is allthe sand that river brings to the sea – that’s right, Stobreč has a sandy beach coupled with pebbles. The most attractive and amusing thing about Stobreč is it’s camp – and, as you can assume, it’s situated right next to the sandy beaches. It offers a number of sport and beach activities. The camp was completely renewed in 2008 in order to meet the world’s highest camp standards. Since then CampStobreč became the most attractive camp in this area and further and one of the best camps within Croatia. To become the best,beautiful nature and beaches were not enough. Camp organizes a wide offer of animated activities such as pilates, workout and aqua zumba. There are number of sport activities at disposal too, such as fields for cageball, street basketball, table tennis, bowling or beach volleyball. Children are also welcomed to swimming school, treasure hunt or mini karaoke and other games. Camp has beach bar and restaurant that serves Dalmatian food. Besides camp guests everybody are welcomed to the beach.Later on go for a drink at the beach bar or have a nice meal in the restaurant for good price. 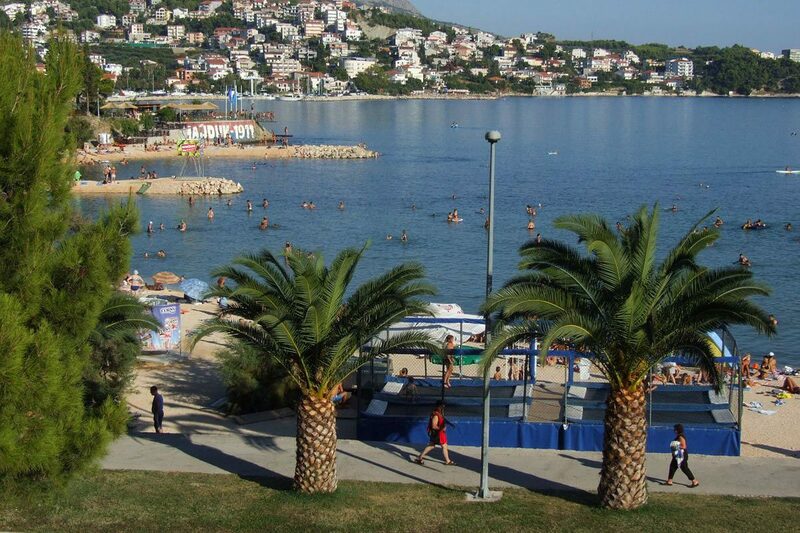 Stobreč offers even more – right after you enter Stobreč there’s a couple of tennis courts. But if you came just to relax and sight-see, you should visit Stobreč church – one is easy to find and from its backyard you can enjoy great view. Another small church, as old as Christianity in this area, is also interesting to visit. But to find it you’ll probably have to ask locals to help you out. They will do it for sure, since they are friendly and approachable. You can also check the rest of the Stobreč center as it has number of restaurant, pastry shops and coffee shops.